When I was a little girl, I loved Danny and the Dinosaur by by Syd Hoff. When I discovered that Candy and the Cankersaur pays tribute to this very book, I was so excited to read it! This book is so much fun, and so cute! It totally and completely reminds me of Danny and the Dinosaur. The colors and the illustration style are just like those in Syd Hoff’s book, and I could not help but think of Danny when I read about Candy. Candy lives in a mansion with her rich dad. All she wanted was to be able to spend more time with him, but since he was always so busy, he decided she needed a really cool pet to keep her company. All of a sudden, a plan lands in her yard carrying a Cankersaurus Rex from The Island that Time Forgot. Candy was scared at first, but decided her new dinosaur, Cank, would be fun to train. They had a lot of fun together, even though Cank kept biting things, until her jealous neighbor, Chucky, decided to kidnap Cank. If he can’t have a dinosaur, then nobody can. Chucky sells Cank to a circus. But then he felt bad because he took his little crush on Candy too far. Candy, Chucky, and her dad decide to save him. 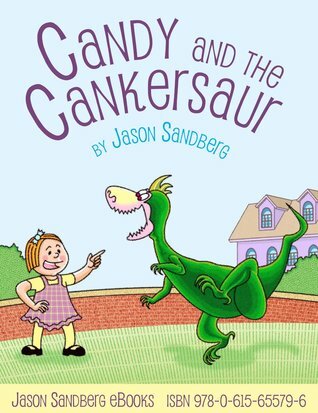 Candy and the Cankersaur is a sweet book for boys and girls. The colorful pictures and silly story will keep them captivated to the very end. I also love the message the book portrays: friendship is better than having the best toys. That’s something all children can learn. I would recommend this to anyone who loves a fun, colorful story and a good teaching opportunity. This sounds like a lovely story. I think my nephew would love it.